Azerbaijan, the land of fire, is a one-of-a-kind destination that refuses to be pigeonholed. From the medieval streets of Sheki to dazzling 21st-century architecture in Baku, it’s a land that will both inspire and amaze. Then there’s Armenia, a complex nation of ancient history, awe-inspiring monuments, amazing landscapes and charming locals. Combined with a visit to Georgia, home to some of the most dramatic landscapes in Eastern Europe, you have all the makings of an unforgettable journey. 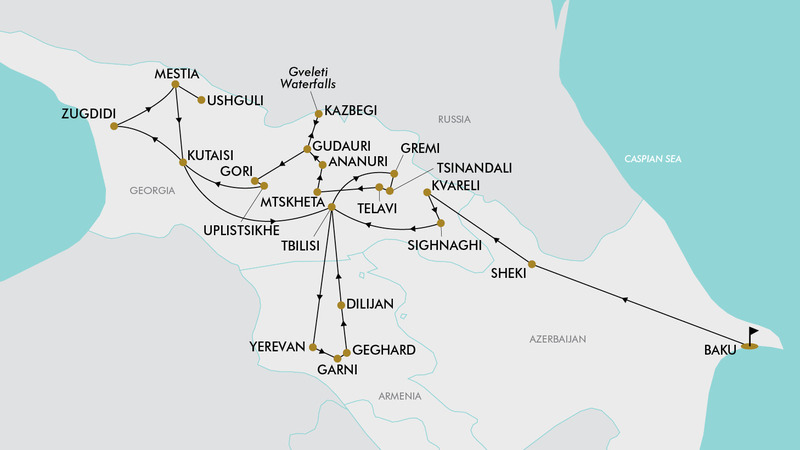 Discover the highlights of Georgia, Armenia and Azerbaijan on this 25 day tour of Baku, Tbilisi, Yerevan, Kazbegi, Mestia and more. Be surprised by the contrast of old and new in beautiful Baku; visit Georgian wine cellars in a tunnel carved into the Caucasus Mountains; and explore the ancient rock-hewn monastery complex of David Gareja. Travel through the Gudauri Ski Region in the Great Caucasus Range; witness the alpine meadows and waterfalls of Khevi; and travel by 4x4 up Gergeti Mountain to the 14th century Gergeti Holy Trinity Church. Enjoy free time at leisure in Baku, Tbilisi and Yerevan, and so much more. Package includes return Qatar Airways flights, 18 nights four-star hotel accommodation, four nights Chateau and lodge accommodation, English-speaking tour leader and guides, and more! Today depart from either Sydney, Melbourne, *Brisbane, Adelaide or Perth for Baku, Azerbaijan. Fly with award winning Qatar Airways (subject to availability). Day 2 Welcome to Baku! Upon arrival be greeted at the airport and transferred to the hotel. This morning after breakfast you will head out on a city tour of Baku. First you will visit Memory Alley (Martyr’s Lane), which is a cemetery and memorial dedicated to those killed by the Soviet Army during Black January and also for those killed in the Nagorno-Karabakh War. Continue onwards to Upland Park where you may enjoy a panoramic view of Baku Bay. Afterwards enjoy a walking tour in the beautiful Old City area (a UNESCO heritage site). See historical and cultural sites such as the Maiden Tower, Shirvanshah’s Palace, Medieval Caravanserai, the hamams (bathhouses), Market Square, carpet shops, art studios and souvenir stalls. After lunch (not included) visit the world class cultural centre named after Heydar Aliyev, Azerbaijan’s third president. The Heydar Aliyev Centre consists of various exhibitions and is recognised as one of the world's most famous buildings, the masterpiece of Zaha Hadid has become an architectural landmark of modern Azerbaijan. Finish the day with a walk along the Seaside Boulevard, the longest promenade in Baku, before returning to the hotel for an evening at leisure. Today is free at leisure, alternatively you may take part in an optional tour (not included). This morning after breakfast you will travel to some mud volcanoes (approx. 70 km from Baku). Mud volcanoes are a unique natural phenomenon with almost half of the mud volcanoes on our planet located in Azerbaijan. Afterwards continue to Gobustan Reserve, an open-air archaeological museum where you can observe the caves and petroglyphs of the Neolithic period (Stone Age). Gobustan has outstanding universal value, its rock art images depict hunting, fauna, flora and lifestyles in pre-historic times. In the afternoon travel onwards to the Absheron Peninsula where you may explore the Fire Worshippers Temple – Ateshgah. Until the late 19th century, it was the Zoroastrian pilgrimage place. Admire the flaming mountain nearby – Yanardag, where natural gas comes to the surface and has been burning since ancient times, attracting fire worshippers throughout many centuries. Return to Baku where you may enjoy the remainder of the day at leisure. This morning after breakfast check out and travel onwards to Sheki in the North-West of the country (approx. 330km from Baku). Snoozing amid green pillows of beautifully forested mountains, Şəki (Sheki) is Azerbaijan’s loveliest town, dappled with old houses with tiled-roofs and topped off with a glittering little Khan’s palace. Along the way you will visit Diri Baba Mausoleum in Maraza Village and the ancient Juma Mosque in Shamakhi, the medieval capital city. You will also cross a river canyon through the beautiful Muganly mountainous pass. Upon arrival in Sheki this afternoon you will enjoy a short city tour. See the city fortress, Sheki Khan Palace, Caravanserai, artisans’ stalls including: stained glass – Shebeke, silk and embroidery shops, potters, confectioners, hatters and numerous souvenir shops. This evening check-in to the hotel for an evening at leisure. This morning check out and continue onwards to the neighbouring country of Georgia. Along the way visit the village of Kish and observe the ancient temple called “the mother of churches”. Once you have completed border formalities and crossed the border you will meet your Georgian guide who will drive you onwards to the town of Kvareli. Upon arrival visit a wine cellar located in a tunnel dug out of the flank of the Caucasus Mountains and taste some amazing Georgian wines. The temperature in the tunnel stays at an idilic 12-14 degrees throughout the year. It consists of two main tunnels, which are linked by 13 galleries. The total length of the tunnel is 7.7 km. After the wine cellar visit continue onwards to the hotel and check-in for an evening at leisure. This morning enjoy breakfast at the hotel before travelling to the Kakheti Region and the picturesque town of Signagi, famous for its pastel houses and narrow cobblestone streets. The town serves as a popular tourist destination thanks to its location at the heart of Georgia's wine-growing region. Set on a steep hill, Signagi overlooks the vast Alazani Valley, with the Caucasus Mountains in the distance. Here you will visit the Bodbe Monastery, originally built in the 9th century. Afterwards drive to David Gareja - a rock-hewn Georgian Orthodox monastery complex located in the Kakheti Region of Eastern Georgia, around 60-70kms southeast of Tbilisi. The complex was founded in the sixth century and features hundreds of cells, churches, chapels, refectories and living quarters hollowed out of the rock face. Part of the complex is within the Agstafa area of Azerbaijan, and is home to evidence of some of the oldest human habitation in the region. Finish the day in Tbilisi, the capital city of Georgia where you will check-in and enjoy the remainder of the evening at leisure. Today is free at leisure to explore this charming capital city. After breakfast at the hotel, enjoy a full day tour of this historic capital city. Begin at the Holy Trinity Cathedral ‘Sameba’, which is the main Christian Orthodox cathedral in Georgia. Continue onwards to see the Metekhi Church of Assumption which rests upon the top of the hill. The church was built by the Georgian King St Demetrius II between 1278-1284. Afterwards, travel up to Narikala Fortress by aerial cable car and take in magnificent panoramic views over Tbilisi and the Kura River. Comprised of two walled sections on a steep hill between the sulphur baths and the botanical gardens of Tbilisi, Narikala Fortress dates back to the 4th century. Enjoy a stroll to the Legvtakhevi Waterfall, located in the centre of Tbilisi, and also take a walk through the luscious botanical gardens. Continuing the tour, you will visit Shardeni Street and Meidan Square, which are known for their outdoor cafes, galleries and souvenir shops where you can enjoy a refreshing drink before continuing on to Rustaveli Avenue. The avenue starts at Freedom Square and extends for about 1.5 kms. Rustaveli is often considered the main thoroughfare of Tbilisi due to the large number of governmental, public, cultural, and business buildings located along and near the avenue. Next travel on the Tbilisi Funicular to Mtatsminda Park, which is located at the top of Mount Mtatsminda and overlooks the city. The park has carousels, water slides, a roller-coaster, funicular and a big Ferris Wheel at the edge of the mountain which offers splendid views. Today you will travel onwards to Telavi. The first stop of the day will be the Tsinandali Museum of Alexander Chavchavadze - a Kakhetian nobleman and poet. Next you will visit the Shumi Winery which is located close to the museum. Here you will enjoy tasting fine wines and nibbles. Continue to Gremi Citadel and royal residence, a 16th century architectural monument which once functioned as the capital of the Kakheti Kingdom. Also known as the Church of the Archangels, it was commissioned by King Levan of Kakheti in 1565 and frescoed by 1577. Built chiefly of stone, it’s a cruciform domed church which marries traditional Georgian masonry with a local interpretation of contemporary Iranian architecture. This afternoon/evening arrive in the town of Telavi where you will check-in to the hotel and enjoy an evening at leisure. After breakfast drive to Mtskheta, approx. two hours west of Telavi. Mtskheta was a site of early Christian activity, and the location where Christianity was proclaimed the state religion of Kartli in 337 AD. It remains the headquarters of the Georgian Orthodox Church. The Mtskheta historical monuments, which includes the Jvari Monastery of the 6th century and the Svetitskhoveli Cathedral of the 11th century, are recognised as a UNESCO World Heritage Sites. Afterwards drive approx. two hours north to the Gudauri Ski Resort via the scenic Georgian Military Highway, where you will enjoy picturesque views of the Great Caucasus Range, winding serpent roads, beautiful mountain villages and towering waterfalls. Along the way, stop to visit the Ananuri Fortress, the former residence of the Dukes of Aragvi, a feudal dynasty which ruled the area from the 13th century. The castle was the site of numerous battles. From here you will travel to the hotel in Gudauri, (approx. 1 hour away) nestled high in the Caucasus mountains. Enjoy the rest of the day at your leisure, followed by an included dinner this evening. After breakfast, set out to explore the majestic Caucasus Mountains. Travel approx. 1 hour north to the town of Kazbegi, the centre of the Khevi Province in the Stepantsminda district. The striking landscapes of Khevi are dominated by alpine meadows dotted with beautiful rhododendron, mountain passes and waterfalls, along with Mount Kazbek, an ice-capped dormant volcano. En-route to the Khevi Province, you will see Jvari Pass, a high mountain cross pass at an elevation of 2379m above sea level on the southern slopes of the Caucasus Mountains in between Georgia and Russia. During your adventures you will make a few stops to taste local mineral water before stopping in Kazbegi. Here you will board a 4x4 vehicle, which will take you up to Gergeti Mountain, where Gergeti Holy Trinity Church - built in the 14th century - acts as a popular waypoint for trekkers in the area. It’s reached by a steep three hour climb up the mountain or, luckily for you, around 30 minutes by jeep up a mountain trail. Afterwards return to Kazbegi and travel onto Darial Gorge on the border between Russia and Georgia. Almost 13kms in length, the gorge features steep granite walls reaching as high as 1800m in some places. While there, enjoy an easy short stroll to the beautiful Gveleti Waterfalls. In the evening you will be transported back to your hotel, where you have the rest of the evening to spend at your own leisure with dinner included. After breakfast, drive to Gori (approx. two hours) where soviet dictator Joseph Stalin was born and spent his first four years. Nowadays his former home functions as a museum with items related to his life. The museum contains the dictator’s personal train carriage, as well as a museum building and the small house where he was born. Continue onto Uplistsikhe, an ancient rock-hewn town in eastern Georgia, followed by Kutaisi - the legislative capital of Georgia and capital of the western region of Imereti - via Rikoti Pass. Historically one of the major cities of Georgia, it served as the capital of the Kingdom of Georgia in the Middle Ages, and later as the capital of the Kingdom of Imereti. The Parliament of Georgia moved to Kutaisi in 2012 in an effort to both acknowledge the status of the city, and to decentralise the Georgian government. On the way back to the hotel, enjoy a few stops along the way to visit pottery and farmers markets. Arrive at the hotel and enjoy the rest of the day at leisure. After breakfast, drive 20 minutes to visit the Sataplia Karst Caves and Natural Reserve. Though rather small, the cave is famous for fine specimens of speleothem cave formations, as well as dinosaur footprints nearby. The tour enters the through-cave on one hillside, crosses the hill underground, and then surfaces near the dinosaur footprints. The cave is named after Mt. Sataplia (494m), an extinct volcano, which is now the nature reserve. The reserve was intended to protect the five karst caves of the area and the dinosaur footprints. At present there are 200 known footprints found in two different layers of the Cretaceous limestone. The 30cm long footprints of the lower layer belong to an unknown predator, while the 48cm long footprints of the upper layer belong to an ornithopod herbivore. Sapalia has been renovated in recent years and turned into a Jurassic Theme Park. Continue onto Zugdidi (approx. 1.5hrs) to visit Dadiani Palace. This museum was established in the middle of the 19th century by Prince David Dadiani of Samegrelo and still functions as an exhibition, where important findings from the Nokalakevi Archaeological Site are presented. Afterwards drive north to the Svaneti Region. Along the way stop near Enguri Dam, the world's second highest concrete arch dam. Continue onwards back up into the beautiful Caucasus Mountains. Enjoy a 3 hour drive through spectacular mountain scenery before arriving at the picturesque mountain town of Mestia, capital of the Svaneti Region, where you will be transported to the hotel. Enjoy the rest of the day at leisure and an included dinner this evening. Today you will explore the beautiful Svaneti Region, which is surrounded by mountains, glaciers, high peaks and waterfalls. Be driven in 4x4 vehicles to Ushguli Village which is a community of four villages at the head of Enguri Gorge. It’s considered one of the highest continuously inhabited settlements in Europe at 2100m above sea level and due to its particularly inaccessible location, it has kept a timeless feel. The road to Ushguli travels through the villages of Ipari and Kala. The small churches in these villages contain beautiful frescos and murals dedicated to the history of the region. From here you will enjoy a walk towards Shkhara Glacier. Surrounding villages contain old Svan Towers and buildings that make Ushguli part of the UNESCO World Heritage listed sites in Upper Svaneti. In the evening you will return to the hotel (approx. two hours) where you will spend the rest of the evening at your own leisure, with dinner included. After breakfast, enjoy a tour to see the Svan Towers, the symbol of Svaneti and many of which date back to medieval times. These defensive structures were built as protection from invaders and natural disasters. Afterwards continue to the Svaneti Museum, where you will find unique icons and manuscripts from the 4th – 6th centuries, as well as ethnic artefacts associated with Svaneti and its people. After your visit to the museum, you will travel back to the hotel where you can enjoy the rest of the evening to explore at your own leisure, with dinner included. Ride the Hatsvali Cable Car to enjoy magnificent panoramic views of the surrounding area (weather dependant). Following breakfast drive to Martvili, a small town home to the uniquely beautiful Martvili Canyon, a magnificent gorge carved through limestone rocks by the Abasha River. View the beautiful creations of nature with the surrounds of canyons, caves and waterfalls. There are stretches of quiet water where you can take the opportunity to swim, climb on the surrounding rocks, and stand beneath the spectacular waterfalls. In the upper part of the canyon, you will take a short boat trip with a few stops along the way. Head to the beginning of the canyon where you will see the powerful waterfall (approx. 7m high). Once the tour has ended, travel to the hotel in Kutaisi to enjoy the rest of the day free at your own leisure. After breakfast, embark on a tour to the Gelati Academy and Monastery, a medieval monastic complex near Kutaisi. A masterpiece of the Georgian golden age, Gelati was founded in 1106 by King David IV of Georgia in the 12th century. It was one of the first monasteries in Georgia and adds great value to the Georgian culture and beauty. The next stop is the Bagrati Cathedral, built in the early years of the 11th century. Conservation and restoration works, as well as archaeological studies at the Cathedral began in the 1950s under the leadership of a Georgian architect Vakhtang Tsintsadze, and concluded in 2012. After the tour you will continue back to Tbilisi and be transferred to the hotel with an evening at leisure. This morning be transferred to the Sadakhlo (Georgia/Armenia) border arriving mid morning. Please note: you may be asked to exit the vehicle at the border's indoor terminal, where your belongings will be scanned prior to leaving the Georgian side of the border. After this short stop, you will continue onwards to Alaverdi. Along the way you will visit the UNESCO listed monasteries of Sanahin and Haghpat, two masterpieces of Armenian architecture from the 10th and 13th centuries. The two complexes are very close to one another, however they are separated by a deep crevice formed by a small river that leads into the Debed River. Haghpat Monastery was one of the largest religious, cultural and educational centres of medieval Armenia. Afterwards you will be transferred to the hotel where you may enjoy the remainder of the day at leisure. After breakfast, embark on a tour of Yerevan, the capital of Armenia. The city is known by locals as the ‘pink city’, due to the colour of stone commonly used on the buildings. In the city centre you will visit Republic Square and Mashtoc Avenue, where you will see some of the most prominent buildings and attractive structures. Next you will see the gorgeous Yerevan Cascade, a giant multi-level stairway built of limestone and adorned with modernist sculptures. The stairs direct visitors’ gaze to views of central Yerevan and Mount Ararat. At the base of the Cascade is a garden courtyard with statues by contemporary sculptures such as Botero. Continuing onwards you will visit the Yerevan Theatre of Opera and Ballet which officially opened in 1933, with Alexander Spendiaryan's Almast opera performance. Next stop is the Mesrop Mashtots Institute of Ancient Manuscripts, a museum and repository of ancient manuscripts. A short walk onwards will take you to the Yerevan Brandy Factory, founded in 1887 during the period of the Russian Empire. The tour will continue to the monuments of the Zvartnots Cathedral, which translates to 'Celestial Angels Cathedral'. The next monument on the list will be the Ejmiatsin Cathedral (a spiritual centre) which according to scholars, was the first cathedral built in ancient Armenia. The original church was built in the early 4th century between 301 and 303. Both of these sites are listed on the UNESCO World Heritage Site list. After the tour you will be transferred back to the hotel to enjoy the remainder of the day at your own leisure. After breakfast take a short drive to Garni (approx. 45 mins). Upon arrival visit a Pagan Temple built in the 1st century, the only temple that has been preserved from the Pagan times in Armenia. The temple is at the edge of a triangular cliff which overlooks the ravine of the Azat River and the Gegham Mountains. The temple is part of the fortress of Garni. Continue the tour to the UNESCO listed Geghard Monastery. Once you have been enriched with the local historical monuments you will travel back to Yerevan where you will get the chance to explore the local fruit markets and then enjoy the remainder of the day at leisure. Today is free at leisure to explore this charming capital city, or alternatively you can take part in an optional tour (not included). After breakfast, you will take a trip to Khor Virap Monastery - which translates as “deep dungeon”. Located in the Ararat Plain, near the closed border with Turkey, the monastery was host to a theological seminary and was the residence of Armenian Catholicos, Gregory the Illuminator. Here enjoy the spectacular view of the sacred Ararat Mountain - an immortal symbol of Armenia with the monastery being surrounded by green pasture lands and vineyards. You will then continue to Noravank, an Armenian monastery built in the 13th century and nestled in a gorge by the Amaghu, amongst amazing sheer rocks on the twisted bends of the river. The monastery is best known for its two-storey Surb Astvatsatsin (Holy Mother of God) church, which grants access to the second floor by way of a narrow stone-made staircase jutting out from the face of the building. The tour ends with a stop in the village of Areni, an important centre in the production of wine. You will travel back to the hotel where you will have the rest of the day to spend at your own leisure. Today you will drive to Lake Sevan, one of the largest freshwater high altitude lakes in Eurasia, where you will have some time to enjoy the scenery and stunning blue water. From here you will visit Sevanavank Monastery, a monastic complex in the Gegharkunik Province of Armenia. Continuing onwards, you will drive to Dilijan and enjoy a city tour. Usually called Armenian Switzerland or Little Switzerland by the locals, it’s one of the most important resorts of Armenia, situated within the Dilijan National Park. The forested and reclusive town is home to numerous Armenian artists, composers, and filmmakers and features some traditional Armenian architecture. Sharambeyan Street in the centre, has been preserved and maintained as an "old town", complete with craftsman's workshops, a gallery and a museum. Once you have had time to take in the history of the town of Dilijan, you will then be transferred to the hotel in Tbilisi, via the Sadakhlo border where you will transfer through the terminal for baggage scanning (this takes around 10-15 minutes). Once this process is complete you will continue onto Tbilisi where you will have the rest of the day to spend at your own leisure. After breakfast, you will be transferred to the airport for your flight back home. Due to limited flight scheduling, some customers may experience a layover of up to 6 hours on this outbound flight. Lounge passes may be purchased at your own expense. Travel offer is valid for travel on selected dates until the 12th October 2020. For solo travellers a mandatory single supplement of $1100 applies. Qatar Airways plus any codeshare partners (subject to availability). - Only an outbound or inbound stopover may be chosen; you cannot choose both. - Baku, Azerbaijan (Pre Tour): $150 per room including breakfast. - Tbilisi, Georgia (Post Tour): $200 per room including breakfast. 2 x Twin Beds or 1 x Double Bed (subject to availability). Minimum group size 12, maximum group size 18 per vehicle. - Day 4: Baku: Mud Volcanoes & Gobustan Reserve Tour - $50 per person. - Day 22: Yerevan: Khor Virap Monastery, Noravank Monastery & Areni Village Tour - $35 per person. - Visa fees and requirements (A tourist visa is not required if travelling to Georgia or Armenia on an Australian passport, but an e-visa is required for Azerbaijan). - Recommended gratuities/tipping: $3USD per person/day payable on tour. Baku has a temperate semi-arid climate with hot and humid summers, cool and occasionally wet winters, and strong winds all year long. The city experiences very warm summers and moderately cold winters. Like other regions of Georgia, Tbilisi receives significant rainfall throughout the year with no distinct dry period. The climate of Mestia is humid and is influenced by the air masses coming in from the Black Sea throughout the year. Average temperatures and precipitation vary considerably with elevation. Yerevan features a continental influenced steppe climate with long, hot, dry summers and short, but cold and snowy winters. This is attributed to Yerevan being on a plain surrounded by mountains and to its distance from the sea and its effects. Please note: a moderate level of fitness will be required. If you have any concerns please consult your healthcare provider prior to purchase/travel. Gratuities (tips) are not included in the tour price for services of the tour leader (when available) and driver throughout the tour. The recommended tip is $3USD per person per day this covers the guide/leader and the driver, which will be collected whilst on tour. Australian passport holders can visit Georgia without a visa for periods of up to 12 months. Australian passport holders can visit Armenia without a visa for up to 180 days per year. A tourist visa is required for Azerbaijan if travelling on an Australian passport. Electronic visas (e-visa) are for single entry, 30 day stays are available online through Azerbaijan's State Agency for Public Service and Social Innovations here: https://evisa.gov.az/en#. Allow at least three business days for online applications to be processed and ensure your passport is valid for at least three months from the expiry date of the e-visa. If your passport contains visas/stamps from the disputed territory of Nagorno-Karabakh, you'll likely encounter difficulties at Azerbaijan border control points and could be refused entry into Azerbaijan.